The Saturn Kaboats are back in stock!!! HomeBoatsToGo - Blog About Inflatable Boats, Inflatable Rafts, Inflatable Kayaks And More...The Saturn Kaboats are back in stock!!! We had an unexpected spike in demand over the first few months of 2012 and our large KaBoat supply quickly ran dry. We were quite happy to see the demand, but also very paranoid about inevitably running out of stock! We did eventually watch our warehouse run dry and even with large quantities being manufactured we could not keep up with demand. Our Kaboat is one of my personal favorites and the reasons for me are because of the speed primarily, maneuverability second and efficiency third... Oh yeah, did I mention that these things roll up to fit in the trunk of my little Hyundai Accent with a nice cooler of beer and food??? The dragon boat style hull and thinner than normal boat design make for a boat that flies through the water using less horse power than those of you using dingies and rafts. Since it's less wide it simply goes into better spots in our local mangroves and is easy to maneuver where ever I go. Try rowing a full size dingy and get back to me! The Kaboat is just a super cool boat and my boat of choice for just getting on the water and having a good time. Since I work here I should say that it is absolutely awesome for fishing and can get you from here to there faster, quieter and with more freedom than peoples other options. And something else I can't forget to mention... 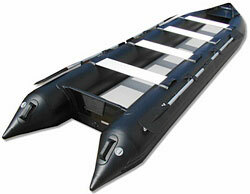 The design of this boat is very rugged and stable; as stable as a full size inflatable. Yes, it's true, no kidding! What is my favorite Kaboat you ask? The 16' black 487XL! Have you seen this one??? It looks like it's out of a military special ops mission! We finally did catch up on production of the KaBoats to meet the spike in demand and we now have every variety in stock. The truth is we can maintain the current ordering levels but if there is another spike we may be out of stock temporarily again. I strongly recommend this boat for a great time on the water with better speed and agility. I just love this boat, this KaBoat that is!